Windows 8 Consumer Preview Already Launched! Download and Try! 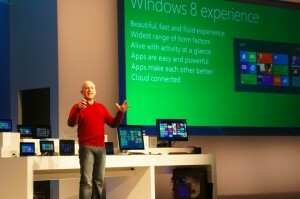 Microsoft recently launched its Windows 8 Consumer Preview. Steven Sinofsky revealed that Microsoft has made over 100,000 major code changes to Windows 8 since the Developer Preview was released in September. Antoine Leblond, vice president of Windows Web Services, showed off how the OS ran on a typical computer with a mouse and desktop. Simple tasks like copying and pasting have been drastically improved in Windows 8.